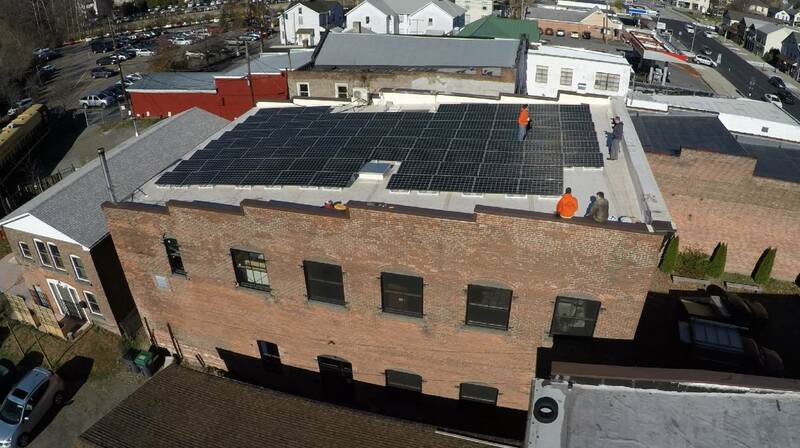 Solar panels on top of The Cooperage Project’s roof in Honesdale, PA. Photo courtesy of The Clean Energy Co-op. 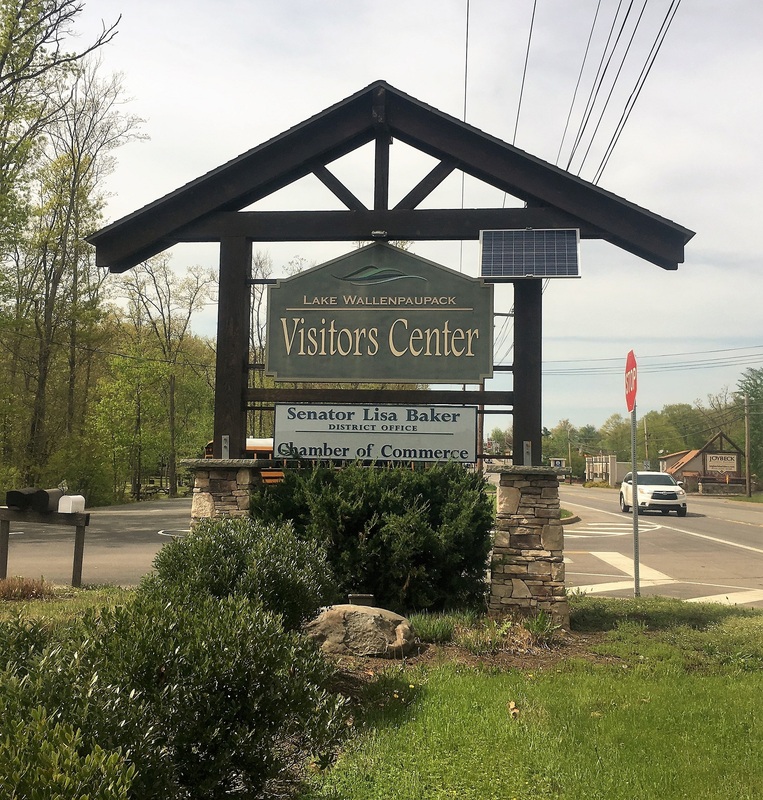 Lake Walenpaupack Visitor Center sign is solar powered. Photo courtesy of The Clean Energy Co-op. Waymart wind farm on Moosic Ridge in Wayne County. Photo courtesy of NaturED. 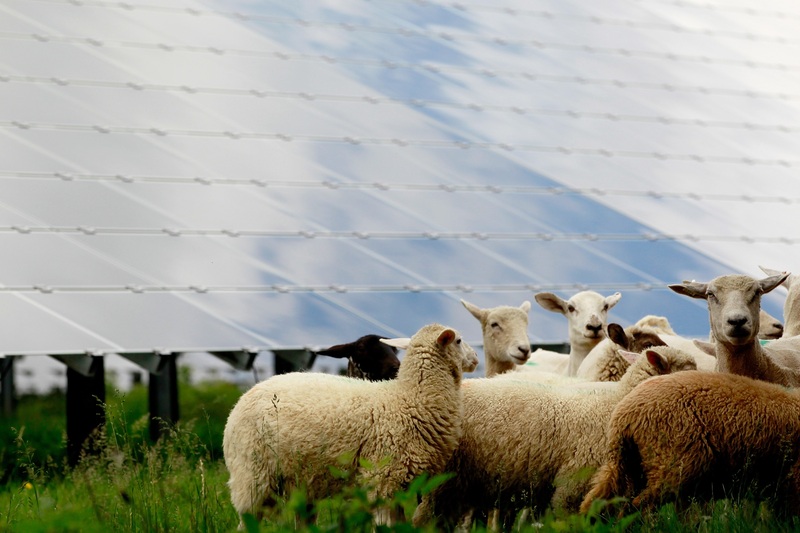 Sheep graze beside solar panels at Pocono Raceway, Long Pond, PA. Photo by Brian Lawdermilk/NASCAR via Getty Images. Click to reveal the discussion! Click again to hide this. The sun and its sunlight (Solar energy) hitting the Earth provides all the energy for nearly all the life that we know of, and (except for nuclear energy, and arguably, geothermal & tidal energy) is the underlying source for all the energy humankind has ever used throughout our existence. Wind and ocean currents (and in the water/rain cycle) move because of the difference in temperatures from sunlight warming various parts of the Earth. Plants and trees collect sunlight, storing the energy as chemical bonds in their bio-mass. Animals, including humans, then eat those plants to gain energy. We harvest wood to build structures or burn for heat. Decayed bio-mass, after millions of years under pressure within the Earth, transforms into fossil fuels, including the Coal and Natural Gas we burn today. Ancient Egyptians, Chinese, Greek and Native American cultures oriented their buildings and homes to maximize the collection of passive Solar energy to keep them warm, and to light the interior. Sunlight can start fires, melt snow & ice, heat our food and other materials, tell us the time of day, and provide directions (it rises in the east, sets in the west). Lightning storms are an indirect result of heating of the Earth’s atmosphere by the sun. In 1839, a 19 year-old French physicist, Edmond Becquerel, working in his father’s laboratory, invented the first “solar cell” and discovered the photovoltaic (PV) effect, when sunlight shining on his invention produced an electrical current. Becquerel went on to discover other electrical effects and photographic processes, but his solar cell never ‘saw much light’ as it was impractical outside of a chemistry lab. It took Albert Einstein in 1905 to fully explain how and why it works, for which he was awarded the 1921 Nobel Prize. It wasn’t until 1954 that Bell Laboratories publicly revealed the first practical solar cell, built using a silicon semiconductor and without any moving parts. So began the modern solar industry. Solar PV now commonly powers our road signs, our homes, businesses, community centers, and even the Pocono Raceway. As of 2017, solar provides less than 0.5% of Pennsylvania’s electricity supply, but is increasing rapidly with significantly lower costs. Throughout history, Wind power has been used to dry our clothes, push sailboats for transportation, pump water out of the ground or uphill for storage, and to power industrial mills of various types. Wind turbines rotate a generator to produce electricity. 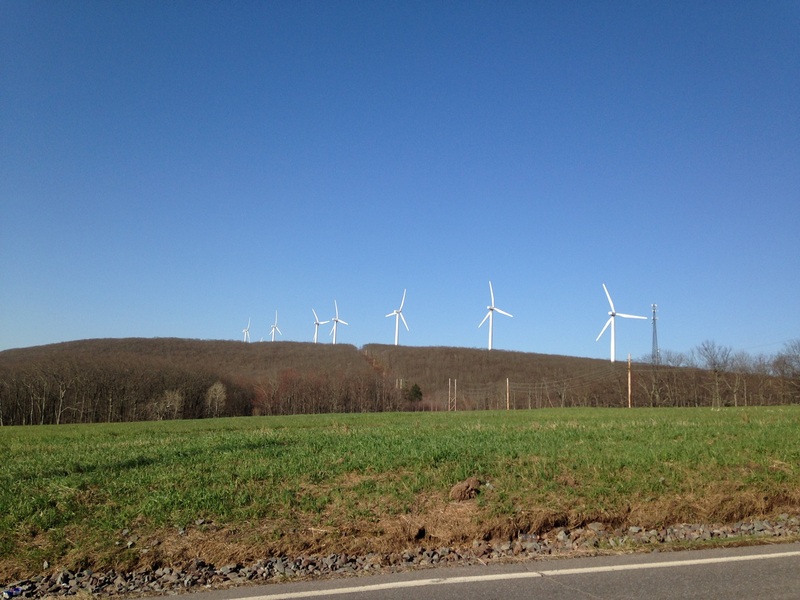 The second oldest and largest wind farm in Pennsylvania began production in 2003 on Moosic Ridge in Wayne County. As of 2017 Pennsylvania has over 1300 megawatts of wind power generation installed on 27 wind farms and provide enough electricity, on average, to power nearly 350,000 homes, which is approximately 2% of Pennsylvania’s electricity supply. 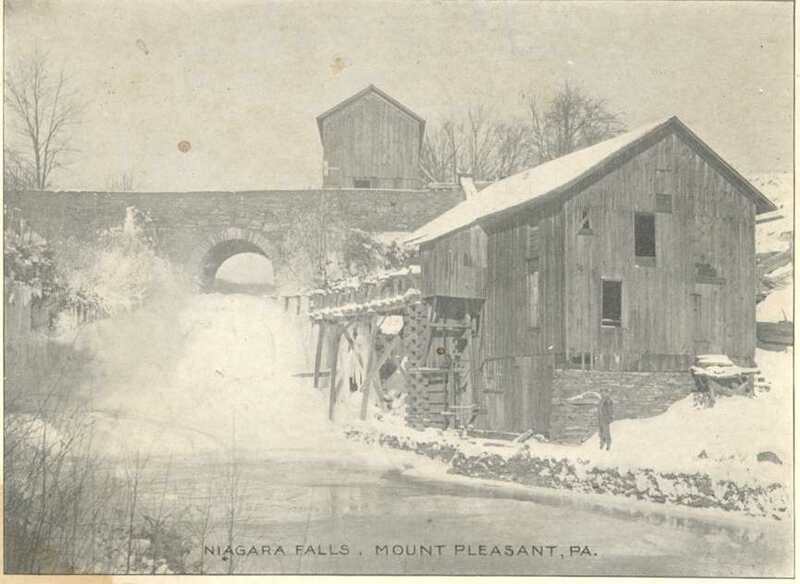 Postcard from the 1800’s of Niagara Falls, Mount Pleasant, PA. Photo courtesy of the Wayne County Historical Society. High Falls at Wilsonville on the Wallenpaupack Creek. Photo courtesy of the Wayne County Historical Society. Wallenpaupack dam and flowline view from the original creek bed. Photo courtesy of Brookfield Renewables. Water power, or hydro-power, has been in use since early in human civilization for irrigation, transportation, and to power lifts, cranes and all types of industrial mills. The first commercial hydroelectric power plant was built at Niagara Falls in 1879. Conventional hydroelectric plants require the damming of a flowing river to create a reservoir, so there are limited places where they can be built. The weight of moving water (both its potential & kinetic energy) drives a turbine generator to create electricity. A hydro-power station consumes no water, unlike all types of steam-powered turbines fueled by other resources. Pennsylvania Power and Light built the 5,700 acre Lake Wallenpaupack in the Poconos in 1926. The project took 2,700 people about two years to complete, which included the construction of the 1,280-foot-long and 70-foot-high dam, two earthen dikes, a wooden flow line and the hydroelectric power plant. Once the dam was closed off, the reservoir took about seven months to fill. Water from the bottom of the lake flows into a 14-foot-wide pipe called a flow line, then travels 3.5 miles to the power plant where it spins two turbines as it rushes past them. The turbines spin within each of the two generators to create 44 megawatts of electricity, which is enough power for about 35,000 typical homes. When the water exits the power plant, it flows into the nearby Lackawaxen River, and from there into the Delaware River. Lake Wallenpaupack and its power plant are currently owned by Brookfield Renewable Partners. The ability of generation plants like Wallenpaupack to quickly respond to increases in electrical demand or fill in for larger plants helps reduce problems on the electricity grid. 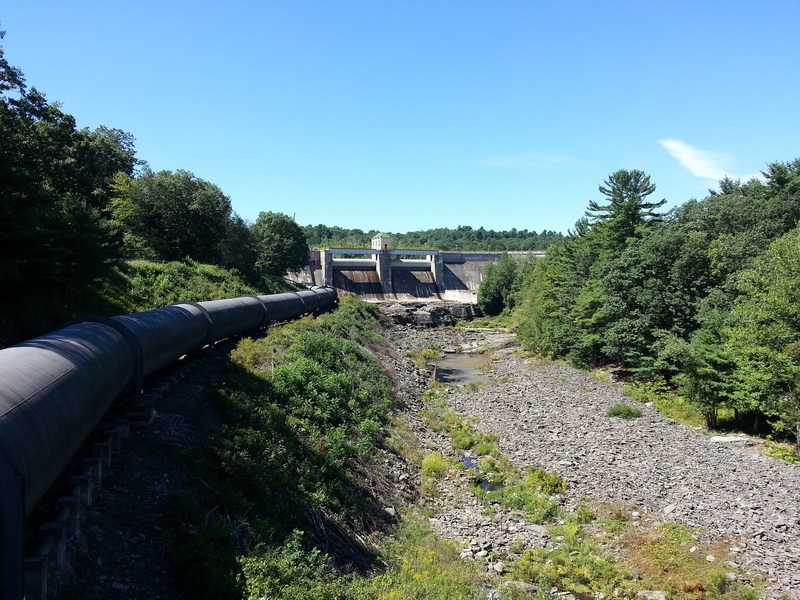 Brookfield also manages the lake level in support of recreation, flood control, and to provide water to the Lackawaxen River in support of boating and fish habitat. Hydroelectricity is relatively low cost, making it a competitive source of renewable electricity, but currently produces only about 1% of Pennsylvania’s electricity supply. View of Boyd’s Mill, Damascus, PA located near the Delaware River in Wayne County. 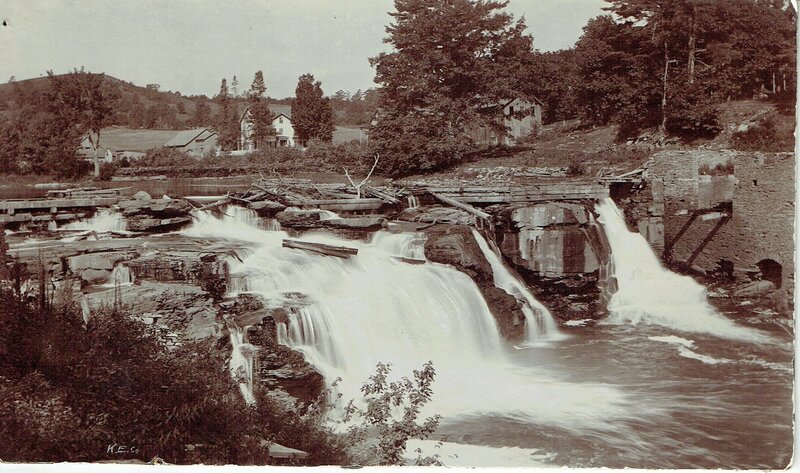 Photo courtesy of the Wayne County Historical Society. 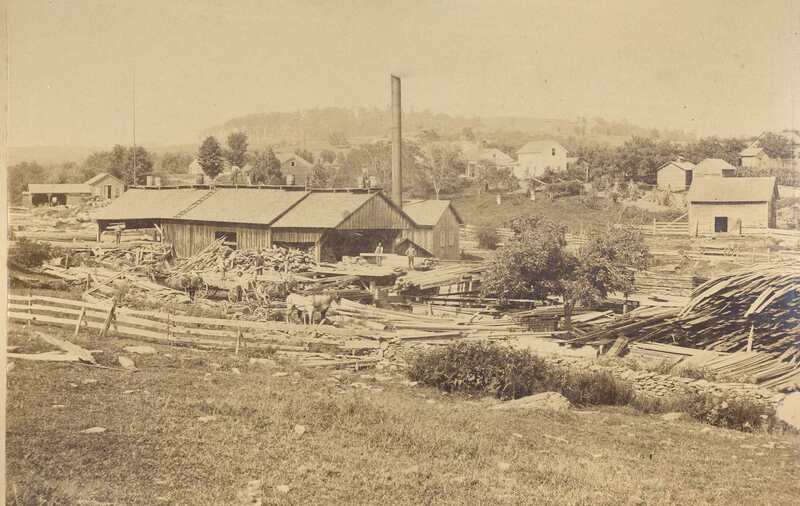 Farnham and Collingwood saw mill at Wilsonville, Paupack, PA. Photo courtesy of the Wayne County Historical Society. 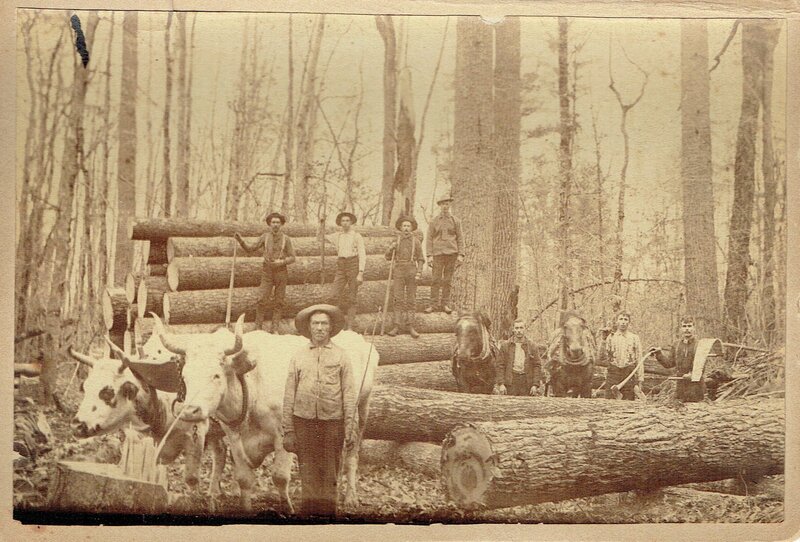 Men and oxen labor in the 1800’s to cut and transport lumber. Photo courtesy of the Wayne County Historical Society. Split wood, chips, lumber scraps and other woody bio-mass can be burned for heat, though softwoods should be used carefully, since their creosote can clog and ruin a woodstove. Modern wood furnaces often use a compressed wood pellet, enabling automated fueling and highly efficient burning with reduced chimney emissions. Wood from trees is abundant in Poconos and throughout Pennsylvania. Native Americans and early settlers used, and many rural residents still use, firewood for space heating or indoor cooking, as well as outdoor campfires. Trees are harvested not just for lumber, but for other products, such as wood-pulp (to make paper), sawdust, bark, cellulose (insulation) and wood chips. The charcoal used in outdoor grilling is made from wood (not coal). 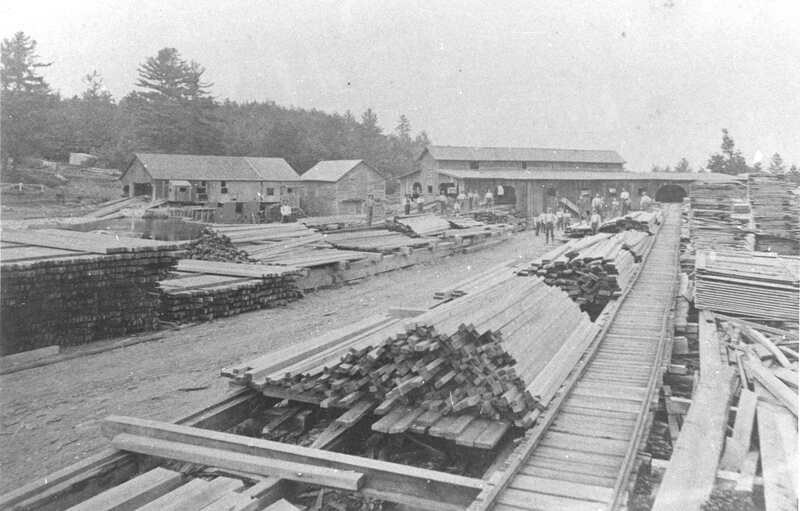 Our state lumber industry grew rapidly during the 1800s, often using rivers to float logs to sawmills and to market. After 1910, deforestation became a serious concern and drove a forest conservation movement. Today, Pennsylvania’s land area is more than 50% forest and growing, and PA is the #1 domestic producer of hardwood lumber. Wood is not generally used to generate electricity. 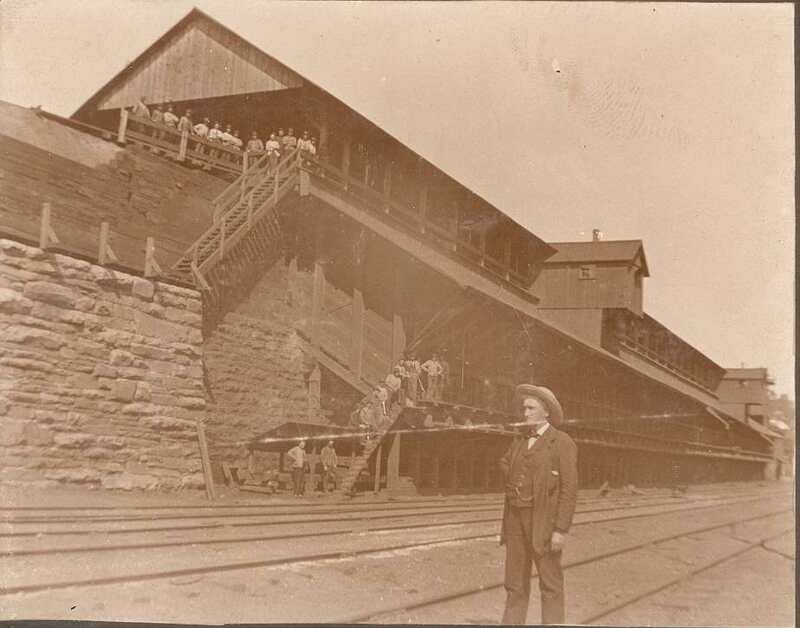 Coal pocket along railroad in Hawley, PA. Photo courtesy of the Wayne County Historical Society. Coal pile at No. 2 Canal and Gravity Railroad, Honesdale, PA. Photo courtesy of the Wayne County Historical Society. 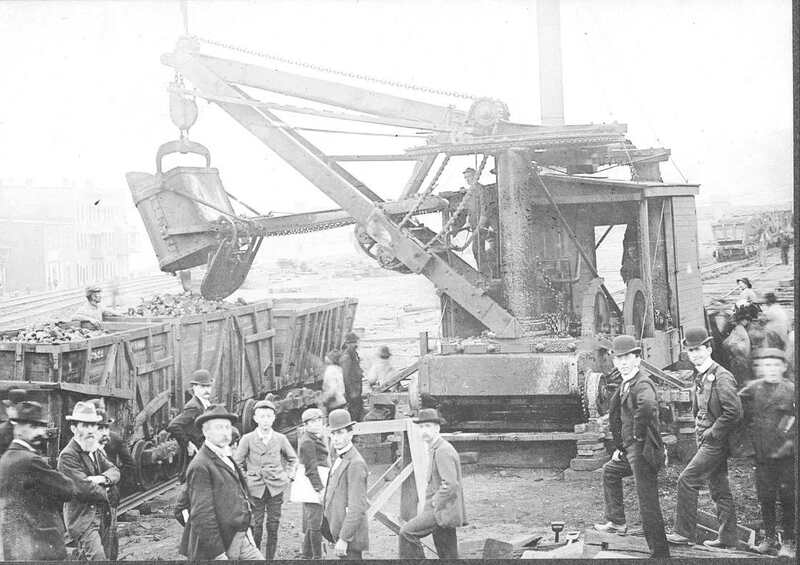 Steam shovel loading coal onto rail car. Photo courtesy of the Wayne County Historical Society. Coal has been used as a energy source since neolithic times, and is a combustible black or brownish-black sedimentary rock usually occurring in layers or veins. Coal is composed primarily of carbon, along with variable quantities of other elements, including hydrogen, sulfur, oxygen, nitrogen, and mercury. Coal is a fossil fuel that forms when dead plant matter is converted into peat, which in turn is converted into lignite, then sub-bituminous coal, after that bituminous coal, and lastly anthracite. This involves biological and long-term geological processes. Lignite brown coal, lowest content of volatiles electrical power generation; or when polished, an ornamental stone known as jet. Bituminous coal dense sedimentary rock, usually black steam-power generation, and for manufacturing to make coke. Anthracite burns with intense heat and produces a blue flame making it an excellent fuel for heating and smelting, but its relative scarcity makes it more expensive than bituminous coal. 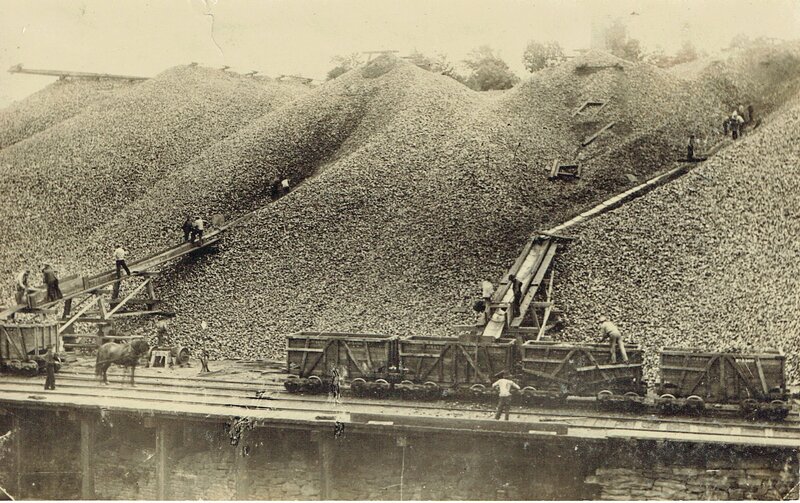 Anthracite mining started in Pennsylvania near Pittston in 1775. By the 1800’s, our region was dotted with industry that used coal locally, or provided transport and storage facilities. Most of the local railroad and canal infrastructure date back to the days of heavy coal production and transportation. Coal-fired generation currently provides about 25% of Pennsylvania’s electricity supply. Coal mining and its burning for industry cause major environmental damage and serious human health issues, including black-lung disease, asthma, acid rain, toxic ash, water contamination, and carbon-dioxide emissions. Burning coal is the largest single human contribution to the increase of greenhouse gases in the Earth’s atmosphere. 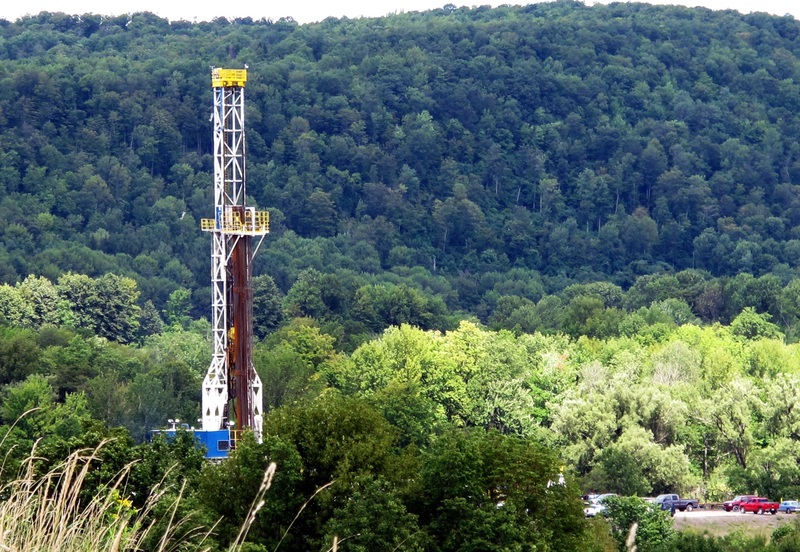 A drilling rig in the Tioga State Forest. Photo by Scott Detrow / StateImpact Pennsylvania. 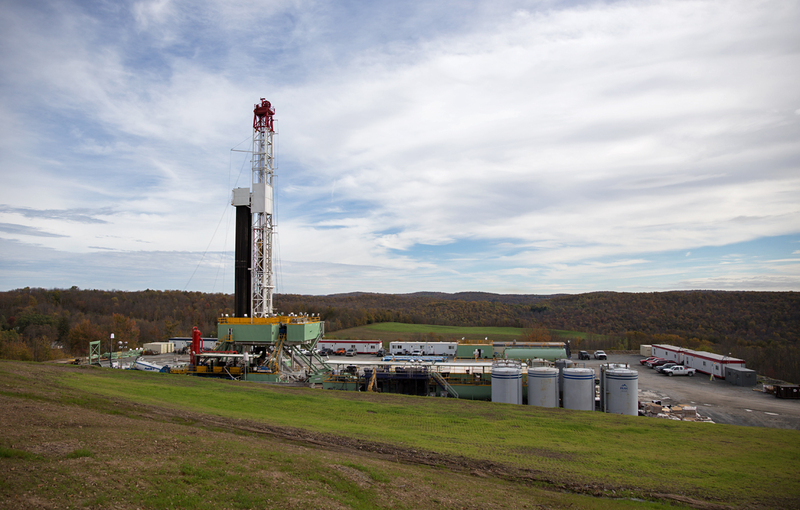 A drill rig near Kingsley, Pa. Photo by Lindsay Lazarski/WHYY. Natural Gas is gathered from drilled wells by pipelines, processed to remove corrosive elements, and then compressed for transport in yet larger underground pipelines to cities, factories and electricity generators. Natural Gas can be stored in underground caverns, in large tanks, or for shipment overseas. Methane leaks from Natural Gas infrastructure and the carbon-dioxide emissions from burning it are also greenhouse gases. In 2016, Pennsylvania was the second largest producer of Natural Gas in the US for the fourth consecutive year. Natural Gas burning turbines provide about one third of Pennsylvania’s electricity supply. Natural Gas is a naturally occurring hydrocarbon gas mixture consisting primarily of methane, but commonly including varying amounts of other higher alkanes, and sometimes a small percentage of other gases. Initially and sometimes still, the gas is burned off as waste from oil drilling. In 1821, the first well specifically intended to obtain Natural Gas was dug in Fredonia, New York by William Hart. After noticing gas bubbles rising to the surface of a creek, Hart dug a 27-foot well to try and obtain a larger flow of gas to the surface. Early on, the primary uses were for outdoor and indoor lighting. Technology advances, such as the Bunsen burner invented in 1885, and improved pipeline infrastructure after WWII has made Natural Gas more useful for cooking, home heating and industrial processes. The background image of a glowing sunset over Lake Wallenpaupack, seen on the display banner, was provided by the Pocono Mountains Visitors Bureau. Individual photo credit given in the thumbnails above.